Georgia Power reported a whopping 6-to-1 savings ratio for every dollar spent on energy efficiency, but the company trails far behind regional leaders and the national average on the relative size and impact of their programs. The following is the third in a series of in-depth posts looking at energy efficiency achievements and missed opportunities for Southeastern states and utilities, as documented in SACE’s recently published Energy Efficiency in the Southeast 2018 Annual Report. You can check out previous posts on SCE&G, North Carolina / Duke, and please stay tuned…there is more to come. Today, Georgia Power will be filing its latest three-year plan for energy efficiency. We expect little more than the status quo. Not only is this unacceptable, customers should rightly be outraged because a failure to invest in efficiency means more energy waste and higher bills for everyone. Last year, Georgia Power reported a whopping 6-to-1 savings ratio for every dollar spent on energy efficiency. This means efficiency in Georgia delivers 6 times more value in kWh savings than equivalent expenditures on traditional energy supply. While energy efficiency is widely recognized as a least-cost energy resource, this financial performance is truly impressive. So why is Georgia Power trailing so far behind regional leaders with its efficiency programs? Just across Georgia’s northern border, Duke Energy in the Carolinas is delivering double the energy savings of Georgia Power as a percentage of annual sales. And Georgia is far behind the national average. Over the past two decades, the Georgia Public Service Commission has laid the groundwork for energy efficiency program success. For example, Georgia and the Carolinas are the only states in the Southeast that allow utilities to earn profits on the efficiency savings they deliver to customers. Like Duke in the Carolinas, Georgia Power hosts a periodic Demand Side Management Working Group, and the company also has dedicated staff working on energy efficiency policy, program design, and implementation. How, then, can Georgia Power push past the status quo and get to the next level? Over the past six years, leadership by Georgia Public Service Commissioners delivered huge investments in solar power that are now lowering customer electric bills. Not only is the Commission justifiably proud of this achievement, the approach taken was unique to Georgia and held true to the Commissioners’ financial principals. Could now be the time for Commission leadership and a leap forward with “The Georgia Way for Energy Efficiency”? 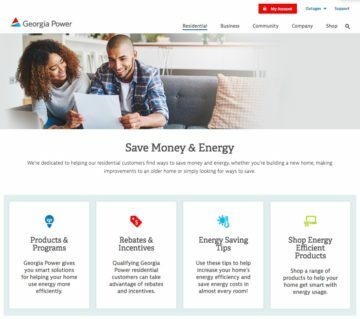 By doubling or tripling current energy efficiency levels, Georgia Power could do much more to lower customer bills, while leveraging millions of private dollars for efficiency upgrades and generating quality new jobs throughout the state. Georgia Power already demonstrated its ability to make huge leaps forward with solar, and Duke Energy has shown that significant gains can be achieved rapidly with energy efficiency. Source: Southern Company, Planning for a Low-Carbon Future (April 2018). 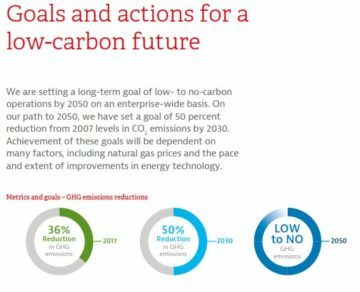 Furthermore, Southern Company has committed to “an intermediate goal of a 50 percent reduction in carbon emissions from 2007 levels by 2030 and a long-term goal of low- to no carbon operations by 2050.” SACE is not aware of any serious, detailed plan for achieving this necessary goal without including all cost-effective energy efficiency, defined as energy savings being less costly than the full cost to generate energy. After the impressive efficiency program financial performance Georgia Power reported in 2018, a big bump in energy efficiency investment over the next three years would be a refreshing show of leadership that we could all be proud of. 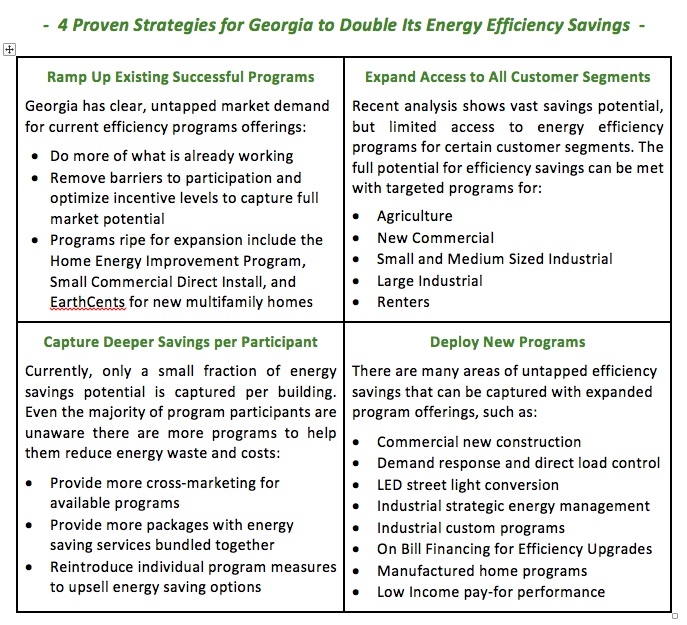 Below is an overview of proven strategies that Georgia Power could use to double its energy efficiency programs.